Psychoanalyst Dr. Carl Jung, as early as 1912, speaks of the "shadow" side of personality. For Dr. Jung, the "shadow" is a world of chaos always ready to burst. He'd use varied expressions to describe it: "the other in us," "the unconscious in us," "repressed self," "the dark side of the personality," "the alienated self," "one's inferior personality." I can think of a family where the father is an over- controlling, abusive King Kong. He is severely wounding - physically and verbally - to all his seven children, from childhood to present even when they're already grown-ups. He insists that his rules in the house are absolute and he often would not explain them to his children. His wife is compliant and afraid to confront him --no matter how irrational and harming his behaviors have become to their children's mental health and well being. In therapy session with one of his adult daughters, Marcia, she tells of her father's family history. Her father's own Dad was an extremely angry and addicted personality. In his own hands, Marcia's father suffered similar physical and verbal abuses since childhood that sent him to the hospital multiple times. It's a well-guarded secret scandal, a "family shadow" that continues to haunt Marcia's father's unconscious "personal shadow," re-living the same drama in his own family and successive generation. As Dr. John Monbourquette put it, "The unloved parts of ourselves which we try in vain to remove from our lives project themselves onto others, forcing us to recognize them." Before you can know and meet your "personal shadow," you need to stop denying its existence. 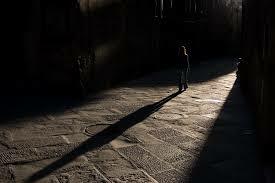 Too often, we're so good at ignoring, burying, or repressing our shadow. As a result, this component gets masked, hidden in the unconscious. And we suffer the natural harm to our well-being and relationships out of it. It's essential, then, to acknowledge the shadow's presence in us, as a first step to heal.